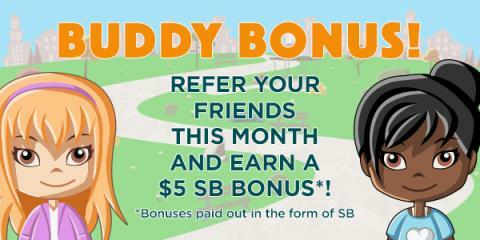 Being Frugal and Making It Work: Get Your Buddy Bonus ~ Join Swagbucks and Start Earning FREE Rewards! Get Your Buddy Bonus ~ Join Swagbucks and Start Earning FREE Rewards! It's summertime, and Swagbucks has brought back a $5 bonus! Swagbucks is a rewards site where you earn points (called SB) for things you're probably doing online already, like searching, watching videos, discovering deals, and taking surveys. Then you take those points and exchange them for gift cards to places like Amazon, Starbucks, Walmart, Target, or PayPal cash. My reward of choice is always the $25 Amazon gift card! I save them all year long and then use them to provide my family with a budget friendly Christmas! 1. Sign up using this link - it's FREE!!!! 2. Earn 300 SB total before 7/1/17. You'll get a $3 (300 SB) bonus for it! That's it. It's super easy, and Swagbucks is for real. I use it myself, and I've been able to give my kids exactly what they want for their birthdays and Christmas without having to break the bank!